Britain’s nuclear arsenal should not be used as a political football in the run-up to the general election next month, according to senior armed forces figures. Their comments come in the wake of a row in which Defense Secretary Michael Fallon attacked Labour Party leader Ed Miliband over his supposed lack of commitment to the Trident nuclear weapons system. Fallon accused Miliband of stabbing the UK in the back at the expense of national security. He accused the Labour chief of offering to trade nuclear defense for Scottish National Party (SNP) backing in his quest for winning office. A former First Sea Lord and Labour peer Lord West also lent his voice, heavily censuring Fallon for his comments. Some critics of Trident, however, have said the current ad hominem tone of debate over Britain’s deterrent is a distraction from the real issues at hand. Kate Hudson, general secretary of the Campaign for Nuclear Disarmament (CND), said on Thursday that the Tories were afraid of a “serious debate” on the issue of nuclear weapons. “With the final vote on Trident replacement due in 2016, at an estimated cost of £100 billion, this is the final election before the decision – and it is one which requires a higher level of debate than the Tories’ name-calling,” she said in a statement. 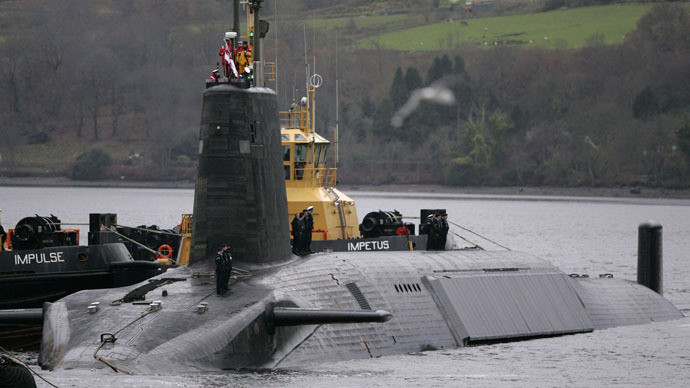 Hudson said senior military figures have warned that renewing Britain’s nuclear weapons will do nothing to keep the UK safe, but will instead cause job losses across the armed forces. “How a blind commitment to squandering our overstretched national resources on a Cold War weapon can be touted as being ‘strong on defense’ is beyond me,” she said. Hudson also pointed to a survey which found that 80 percent of parliamentary candidates from the major political parties oppose modernizing Britain’s nuclear weapons.